It was my first time to be invited by Max's Restaurant last night. 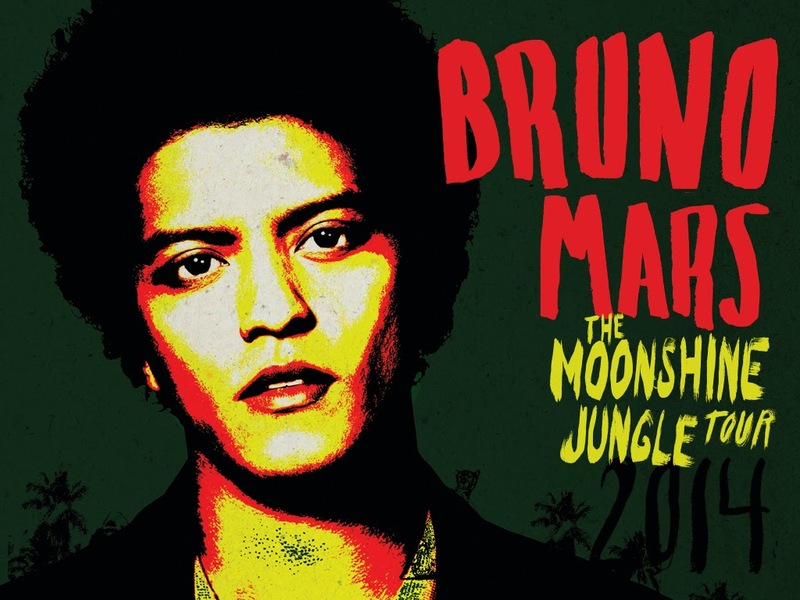 The event is a promotion for The Moonshine Jungle Tour of Bruno Mars, happening on March 22, 2014, 8:00 pm at the Mall of Asia Arena in Pasay City. The e-invite suggested to come in Bruno Mars attire. As an Events Planner, I knew there's something about the theme so I followed as told. There were four of us who came in in Bruno Mars attire. Although I didn't bag the best in Bruno Mars attire, I won 2 concert tickets in the raffle. As the saying goes, beginner's luck. Yeah, baby! 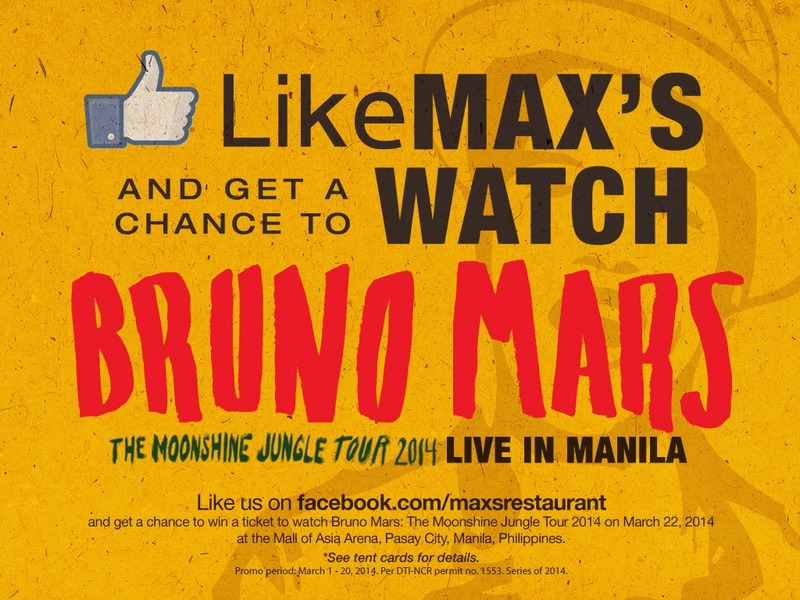 It's so easy to get a chance of winning two tickets for Bruno Mars Live in Manila concert, courtesy of Max's Restaurant. Just 'like' Max's on Facebook and fill up the online entry form to win free concert tickets. Every day, one fan will be chosen to win 2 Moonshine Jungle tickets for free! For more updates, visit Max's Restaurant's Facebook fan page or log on to www.maxschicken.com. Born Peter Gene Hernandez, Bruno Mars grew up in a musical family. His father, Peter Hernandez, was a Latin percussionist while his Filipino mother, Bernadette "Bernie" San Pedro Baluyot, was a singer in Hawaii. Mars wrote and performed music at a very young age and was exposed to a diverse mix of reggae, rock, hip hop and R&B music. He had his share of hurdles early on in his career, but his persistence to succeed and remarkable gift in music helped catapult him to worldwide fame. It was only a matter of time before he captured the world's attention after helping popularize hits like "Nothin on You" by B.o.B, and "Billionaire" by Travie McCoy. 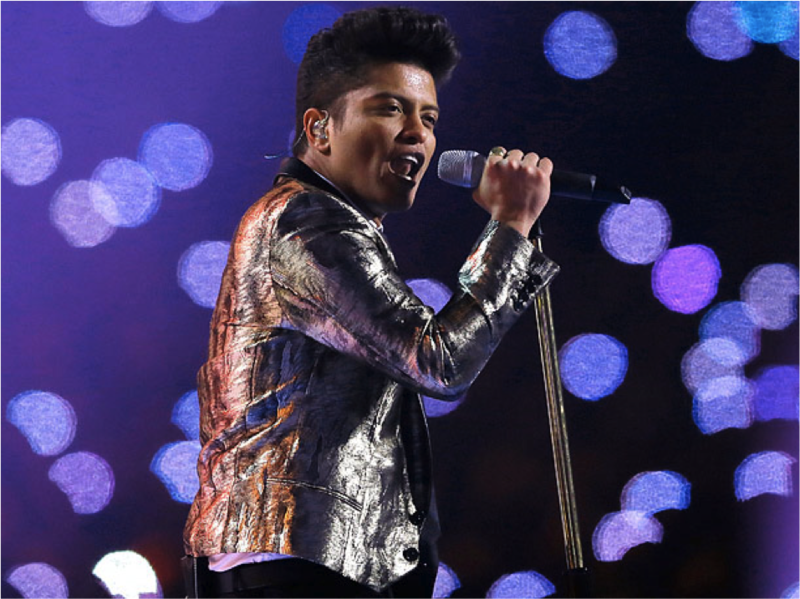 Bruno Mars is one of the most respected and in-demand artists today. He has sold over 115 million records all over the world as a singer, producer and songwriter. A recipient of a number of prestigious awards, Mars has also catalogued 22 Billboard "Hot 100" hits. He was named as one of the top 100 most influential people in the world by Time Magazine in 2011, and was ranked number 1 on the Forbes 30 under 30 list in 2014. With my wonderful mentor, Pehpot.